I love how hands on activities spark engagement in my therapy sessions. Don't get me wrong, I don't go big in every session but when I do, I often find that as engagement goes up, behavior management goes down. 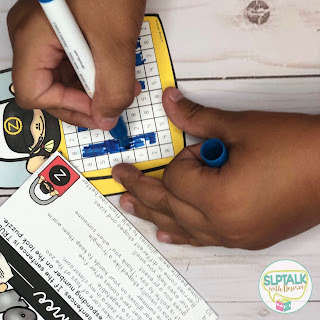 I love how escape challenges facilitate cooperative learning (hello social skills) in a structured way as students work together to complete each mission. I couldn't resist taking the fun into my articulation sessions! 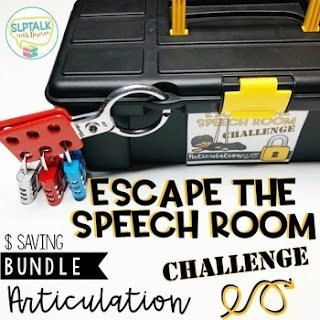 The /th/ Escape the Speech Room Challenge is included in my free resource library if you would like to try it out! In the second mission, the students use the decoder ring to decipher the lock code by spelling it out. Each letter of the alphabet is represented on the decoder ring with a picture containing the target phoneme in either the initial, medial or final position of the word. You may also choose to use the decoder ring for additional therapy activities outside of the Escape the Speech Room Challenge. For example, students could spell their name using the target pictures, spelling/vocabulary words, etc. The third mission includes sentences containing words with the target phoneme. Students determine if the statements are TRUE or FALSE to color a grid which will reveal the third lock code. This mission encourages students to practice the target sound at the sentence level. Two different lock codes are provided for this mission for you to choose from. 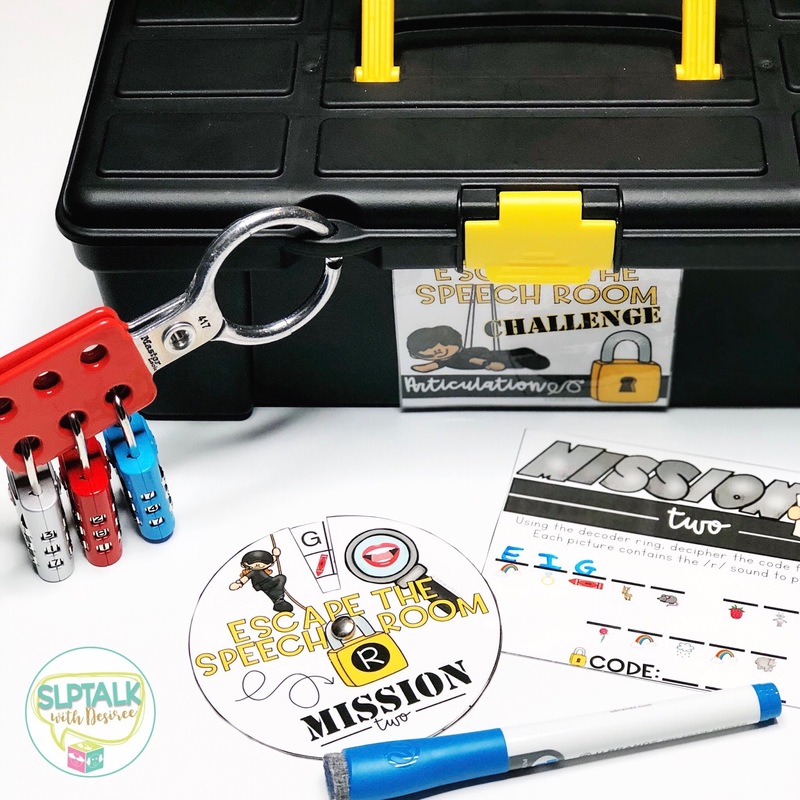 When the students unlock all three locks, they can then open the toolbox to discover "I Escaped the Speech Room" brag tags (included) or a prize of your choice (not included). (Locks that you can program work best. Links are included for the ones pictured). ⇨ HASP - Allows all three locks to be attached to one toolbox. If you prefer, you can add holes to your toolbox or use separate toolboxes. ⇨ Toolbox or container to attach locks to. I purchased the one that I use at the dollar tree. ★ Lock codes are consistent for each Escape Room Challenge to alleviate the prep of reprogramming locks between groups/phonemes. It also allows missions to be used interchangeably within mixed groups. For example, you may choose to use a different phoneme for each mission. ★ If you prefer to set your own lock codes, an option for you to customize is included. This is not digitally editable but allows you to customize printed missions. 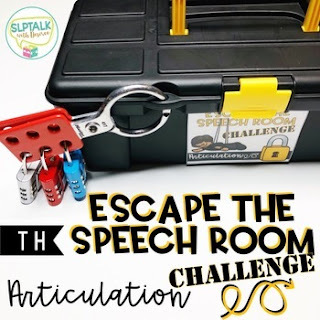 If you would like to try more Escape the Speech Room Challenges, you can find more Articulation Challenges here. I would love to hear what activities your students love! If you try an Escape Room Challenge, let me know how it goes! P.S. If you are looking for an Escape Room Challenge to teach all about SLP, you may also want to read about one I used for my son's career day in this post.